I can't blame you if you have never heard of PopoloCrois. 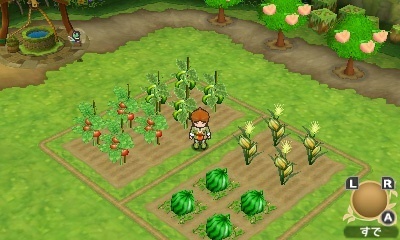 While the series has been around for a while in Japan, the Western world's first taste of the series was in the PSP remake of the first and third games in 2005 (2006 in Europe). Thankfully, though, previous knowledge of the series is not needed to enjoy this new 3DS RPG, which sprinkles in a dash of Story of Seasons gameplay for good measure. But in a world where Rune Factory already exists, is Return to PopoloCrois: A Story of Seasons Fairytale worth the time of day? 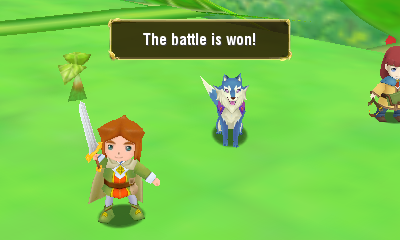 Return to PopoloCrois begins on the 13th birthday of Prince Pietro, the hero of this tale. The young prince learns of some trouble going on about the peaceful kingdom of PopoloCrois, and learns of a means of fighting the black beasts that are attacking and destroying the fertile farmland of the country. Unfortunately Pietro falls into a trap, and gets stuck in another world called Galariland, where the black beasts have already ravaged the land. So, it's up to Pietro and the new friends he makes to both save Galariland and find a way back to PopoloCrois before it's too late. There are plenty of returning characters from previous entries in the series. 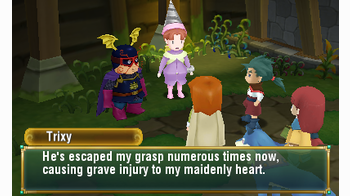 The plot of Return to PopoloCrois is nothing special, but it is charming and generally light-hearted. Honestly, that's the best way to describe the entirety of this game: Light-hearted and charming, if a bit overly simple at times. Take battles, for instance. 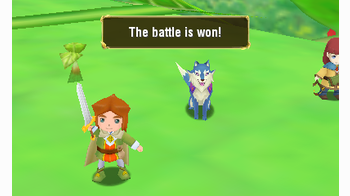 Fights in Return to PopoloCrois are turn-based and the encounters are random. Party members needs to move around the small field to attack enemies (think like Grandia), and certain skills have different areas of effect. However, most battles (including boss battles) are so easy that no real strategy is needed and auto battle can be used up until the final dungeon. The only difficult part I faced during the entire game (which also made me utilize the title's adjustable difficulty settings) was the final boss, which was such a spike up in difficulty that it was downright frustrating. The game also follows a relatively simple flow in terms of game progression. Typically a new area is opened up to explore, allowing the player to poke around the overworld map and eventually find a new town. From there, the plot tends to kick in and the task is revealed: Pietro and his friends must shrink down into corrupted farmland and basically beat up the ailments that are destroying the crops. 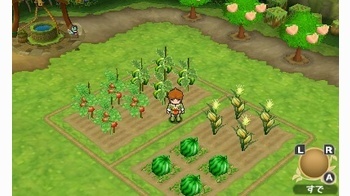 The farmlands are mini-dungeons in themselves, with treasures to find and critters to defeat. Eventually, the party fights a boss or two and moves on to a new area. It's simple, but it works, and Return to PopoloCrois makes sure not to overstay its welcome before the formula would wear thin. The adventure is pretty short, likely not lasting more than fifteen hours for the main story. This works well in the game's favor. With the brisk pace, it always feels like progress is being made and there isn't a lot of fluff. There are extra things to do both during and after the game, such as sidequests, but they by no means bar any progress and can be safely ignored. Return to PopoloCrois is decidedly an RPG first, but there are also influences from A Story of Seasons here, as the subtitle would suggest. Other than the plot revolving around dying farm land and other plant life, Pietro can maintain a farm and grow crops, which he can either sell for some profit or synthesize to make new, better items. There are also other forms of material collection, such as bug catching and mining. It's all very simple and easy to maintain, as crops grow in a mix of real-time and upon story event completion, and there aren't any stamina bars that will go down as Pietro swings his hoe or uses his watering can. Unfortunately, farming feels almost like an afterthought. The entire story can be completed without farming outside of the required tutorial, and money won't even be that tight (as someone that hoarded crops can attest to). 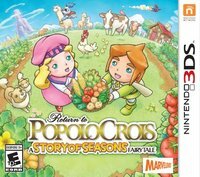 The lack of emphasis on farming is somewhat understandable, given that the PopoloCrois games are story-driven RPGs first and foremost, but it is just a bit disappointing that tending to crops and collecting materials don't have any sort of bearing on the title itself. There is one more major aspect taken from The Story of Seasons that is ultimately a bit of a head-scratcher. There are five young ladies living throughout the world that are 'blessed by the Goddess herself'. What that boils down to is that Pietro can give the girls gifts and talk with them a lot, building up his friendship with them. I say friendship because Pietro cannot marry any of these lovely ladies from another world - after all, series continuity is important! Of course, without the prospect of marriage, giving the girls gifts to ultimately friendzone them just doesn't feel quite so good... especially after these "friendship" meters are maxed out and you reap the rewards of inadvertently leading the ladies on. Besides a few odd choices that don't affect the overall quality, Return to PopoloCrois is a nice, simple, and short RPG. The title really doesn't try to do anything new or revolutionary, but not every RPG has to push the envelope of innovation, either. I think of it as more of a palette cleanser; a good game to play when you just want something to balance out all the complexities and layers upon layers of mechanics of other games. Return to PopoloCrois may not utilize its crossover with Story of Seasons that well, or may not come from the most popular series itself, but is still an enjoyable 3DS title worth looking into.